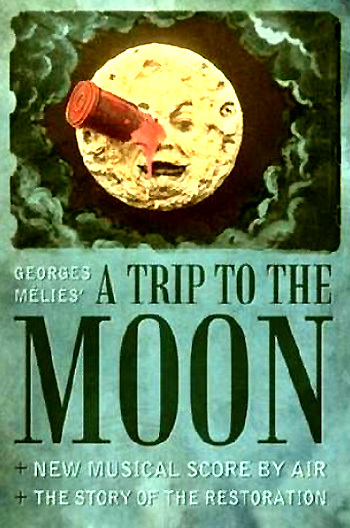 Voyage dans la Lune, Le/A Trip to the Moon (France, 1902), the screen's first science fiction story, was a 14 minute masterpiece (nearly one reel in length (about 825 feet)), created by imaginative French director and master magician Georges Melies (1861-1938) in his version of the Jules Verne story. The silent film's plot, a light-hearted satire criticizing the conservative scientific community of its time, was inspired by Jules Verne's From the Earth to the Moon (1865) and H. G. Wells' First Men in the Moon (1901). Melies wrote the whimsical script, acted in the film in the lead role, designed the sets and costumes, directed, photographed, and produced the film! He hired acrobats from the Folies Bergere to play the lunar inhabitants named Selenites, and the scantily dressed assistants (or pages) who launched the cannon were dancers from the Châtelet ballet. The image of the lunar capsule landing in the eye of the moon is a memorable sight and widely-recognized in cinematic history. As a film pioneer and producer of over 500 short films, Melies made up and invented the film medium as he directed. He developed the art of special effects in earlier films, including double exposure, actors performing with themselves over split screens, and use of the dissolve and fade. He also pioneered the art of film editing. The sets or scenery backdrops in the film are simple, painted flats. It has all the elements that characterize the science-fiction genre: adventurous scientists, a futuristic space voyage, special effects such as superimpositions, and strange aliens in a far-off place. The Scientific Congress at the Astronomic Club. Planning the Trip. Appointing the Explorers and Servants. Farewell. The Workshops Constructing the Projectile. The Foundries. The Chimney-stack. The Casting of the Monster Gun/Cannon. The Astronomers-Scientists Enter the Shell. The Monster Gun. March Past the Gunners. Fire!!! Saluting the Flag. The Flight Through Space. Approaching the Moon. Landing Right in the Moon's Eye!!! Flight of the Rocket Shell into the Moon. Appearance of the Earth From the Moon. The Plain of Craters. Volcanic Eruption. The Dream of 'Stars' (the Bolies, the Great Bear, Phoebus, the Twin Stars, Saturn). 40 Degrees Below Zero. Descent Into a Lunar Crater. In the Interior of the Moon. The Giant Mushroom Grotto. Encounter and Fight with the Selenites. The Kingdom of the Moon. The Selenite Army. The Astronomers Find the Shell Again. Departure from the Moon in the Rocket. The Rocket's Vertical Drop into Space. Splashing into the Open Sea. Submerged At the Bottom of the Ocean. The Rescue. Return to Port and Land. Crowning and Decorating the Heroes of the Trip. Procession of Marines and Fire Brigade. Triumphal March Past. Erection of the Commemorative Statue by the Mayor and Council. The film opens in a scientific meeting/congress of a French astronomical society - the Astronomic Club. The president and various other astronomers enter into a large hall embellished with instruments and are given their telescopes by six female assistants/manservants. A white-bearded, academic professor with a pointed hat named Professor Barbenfouillis (Georges Melies himself), the president of the society, enters while everyone sits, and explains to the members of his plan for an exploratory trip to the moon. On a blackboard behind him with a basketball-looking Earth and a small moon in the upper right hand corner, he illustrates how a rocket will be fired from Earth from a great space gun toward the lunar surface. His scheme is approved by many, but one member violently objects. When order is finally restored after the president throws his papers and books at the dissenter's head, the trip proposed by the president is voted upon. Five learned men/explorers make up their minds to go with him. The female assistants/manservants bring traveling suits for them to change into. The five men (according to the narration, they are named Nostadamus, Alcofrisbas, Omega, Micromegas and Parafaragamus) who accompany the president arrive at the interior of a workshop (signaled by a dissolve) where smiths, mechanics, weighers, carpenters, upholsterers and inventors construct the projectile rocket ship for the mission. One of the clumsy astronomers, Micromegas, falls backwards into a tub of nitric acid. The group is told that if they ascend to the roof where the foundry will cast the space-gun, they will witness "a splendid spectacle" - the casting of the cannon. They climb onto the roof from a ladder, where against the horizon they see chimneys belching forth volumes of smoke. Suddenly, a flag is hoisted, and at the signal, the mass of molten steel is directed from the furnace into the mold for the cannon. The molding process produces flames and vapors, causing the enthusiastic astronomers to rejoice. On the tops of the roofs of the town, pompous preparations have been made. At the launch site, the rocket shell is in position, ready to receive the travelers. The travelers arrive - they respond and reply to the acclamations of the crowd and then enter the steel-riveted shell (their space vehicle). A scantily-clad female assistant closes the door behind them. Many more female assistants/gunners push the shell up an incline into the mouth of the cannon - and it is closed. Everyone anxiously awaits the signal to start the shell on its voyage to the moon - viewed in the far distance. An officer gives the signal for a man on a ladder to ignite the gun. The rocket shell is fired out of a monstrous iron cannon pointed into space. As the hollow, bullet-shaped shell moves through space, the moon approaches [in a sophisticated, multi-plane process shot] and is magnified. As in a fairy tale, it turns out to be a huge smiling face of "colossal dimensions" - it is one of the most recognizable images in film history and often used as the iconic symbol for early pioneering efforts in cinema. The rocket ship shell moves closer and closer to the moon, and then crashes into the pie-face, smack into the right eye of the Man in the Moon. Extremely unreal but very memorable, when the human-faced moon grimaces. After "landing," the scientists' team steps onto the desolate lunar surface through the shell's door, delighted by the unfamiliar landscape marked by craters. Against the moon's horizon, the visitors from another planet (dressed in Victorian garb) look back and see the Earth slowly rising into space. [The illusion of its rising is created by the descent of some of the backdrops.] As they are about to explore, a violent explosion (volcanic?) sends them in all directions. To rest their fatigued bodies after a "rough trip," they stretch themselves out on the ground under blankets. As they sleep - and dream, seven gigantic stars slowly appear in the blackness behind them. Out of the center of each of the stars emerges the face of a beautiful woman. All seem annoyed by the presence of the intruders on the Moon. The astronomers see passing comets and meteors in their dreams. Then, the stars are replaced by a lovely vision of goddess Phoebus (Bleinette Bernon, a music hall singer) sitting on a crescent moon (she is on the Moon and also sitting on the Moon? ), of Saturn in his globe surrounded by a ring, and of two charming young girls holding up a star. By order of Phoebus, they punish the terrestrials by causing a snowstorm, covering the ground with a white blanket of snow. The unfortunate voyagers wake up half-frozen in the cold. They decide without hesitation, and in spite of the danger, to descend into the interior of a great moon crater for shelter. They disappear, one by one, as the storm rages. In the lunar underground kingdom, the scientists arrive at a mysterious grotto filled with enormous mushrooms of every kind. One of them opens his umbrella to compare its size to the mushroom, but the umbrella suddenly takes root and transforms itself into a mushroom and soon grows to gigantic proportions. Strange beings making contortions, moon inhabitants (Selenites - acrobats from the Folies Bergere), emerge from under the mushrooms. One of the fantastic beings rushes at one of the astronomers who defends himself with his umbrella. With a jab of the umbrella, the creature bursts into a thousand pieces in a puff of smoke. A second creature suffers the same fate from the explorers/colonizers. After taking flight, the terrified astronomers are captured when overwhelmed by large numbers of moon people. The group of terrestrials are bound and taken to the palace of the King of the moon people. On his planet's splendid throne, the King is surrounded by living stars. President Barbenfouillis makes a dash at the King of the Selenites, picks him up, and violently dashes him to the ground, causing him to burst like a bombshell. Although pursued, all of them manage to defend themselves, reduce their fragile adversaries to dust with a whack from an umbrella, and escape back to the rocket ship shell - a dissolve moves from one scene to the next. The astronomers shove themselves into the rocket's interior - all except for the President, who is left behind - outside the shell. To propel it back to Earth, he climbs down a rope that hangs from the front of the shell. His weight as he slides down the rope gives the rocket enough impetus to cause it to fall off the edge of the moon. One of the Selenites hangs on the flat end of the projectile and accompanies it on the trip as the rocket drops in space and falls "down" to Earth. The brief journey is a vertical tumble through space.